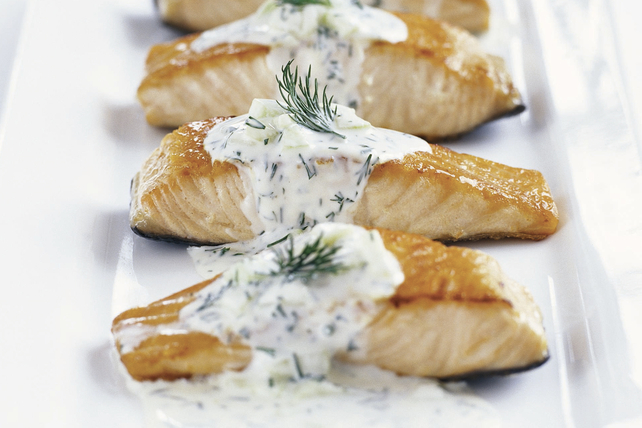 Creamed chopped cucumbers and fresh dill bring the taste of Spring to salmon. Heat oil in large skillet on medium-high heat. Add fish; cook 5 min. on each side or until fish flakes easily with fork. Remove from skillet; cover to keep warm. Add milk and cream cheese product to skillet; cook and stir 2 to 3 min. or until cream cheese is melted and mixture is well blended. Stir in cucumbers and dill. Return fish to skillet; cook 2 min. or until heated through. Serve topped with cream cheese sauce. Check salmon fillets for bones before cooking by running fingers over surface. Small bumps are usually a sign of bones. Use tweezers to remove any bones.